What is the CodeHS Course Resources page? Teachers have access to numerous resources for each course including problem guides, lesson plans, handouts, solution references, and more. With the Course Resources page, teachers can access all of the resources they need for a course — in one place! On the Course Resources page, teachers have direct links to lesson plans and handouts. Activities within each lesson include direct links to textbooks, problem guides, solution references, and the code editor. How do I access the Course Resource page? To access the new Course Resources page, go to your class section roster page, and select the Resources link next to the section’s main course info. 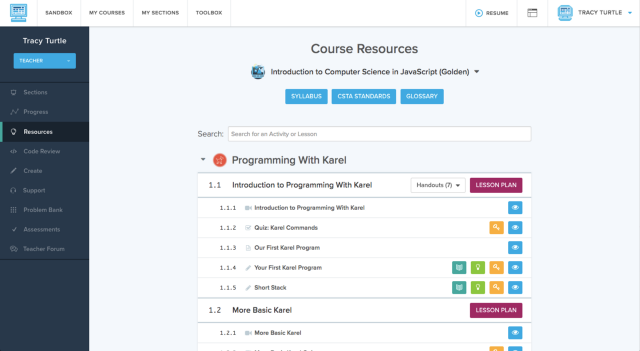 The Course Resource page is a CodeHS Pro feature. If you have any questions, please visit codehs.com/learnmore or email us at hello@codehs.com.